We’re having apple fever around here this week! But I’ve been hating how apples turn brown so quickly. Maybe not as much as my picky 3 1/2 year old, but annoyed just the same. So we decided to test a bunch of those methods you see out there for keeping the apples looking fresh. And why not turn experimentation into a lesson? So we threw in some Scientific Method for kicks, too. 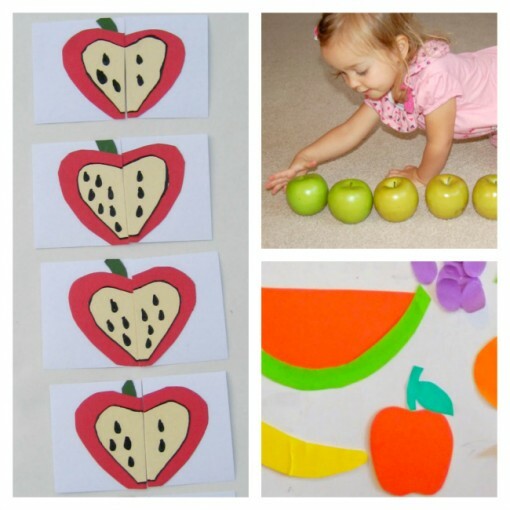 Read on for a fun experiment for kids and what works best for keeping apple slices white. 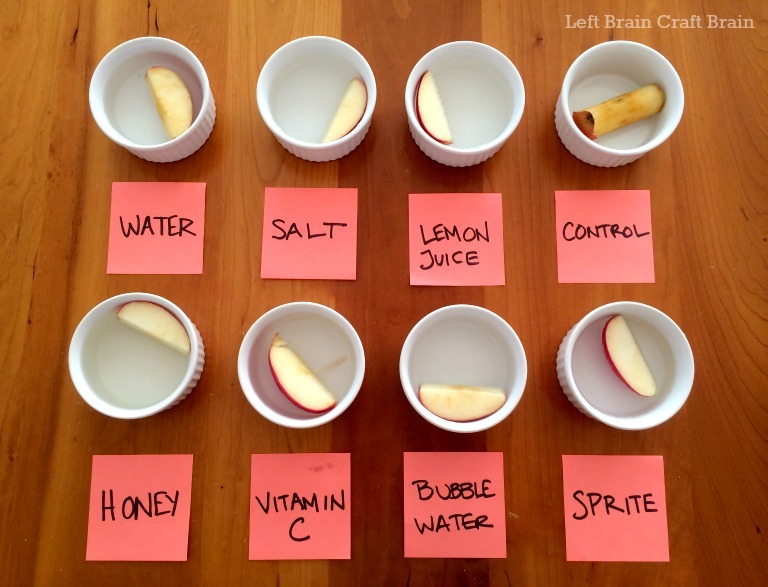 This apple experiment is a great chance to teach the kiddos about the Scientific Method. Why should you bother? The method teaches kids and adults critical thinking and a framework in which to approach any problem, not just ones in science. You can follow along with the experiment and the method below. Plus, check out a quick summary of all the steps in this The Scientific Method Printable from Left Brain Craft Brain. We hate it when apples turn brown. For some reason, they just don’t seem as tasty as when you first bite into them. 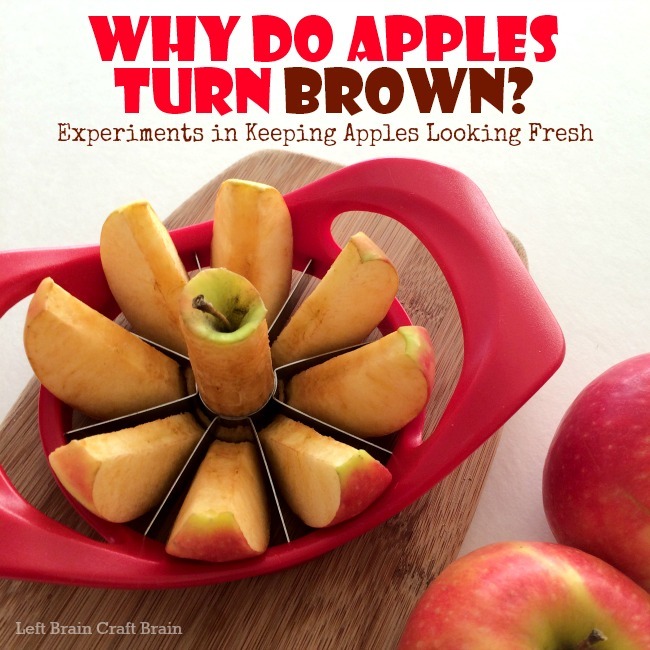 So our question is: What is the Best Way to Keep Apples From Turning Brown? 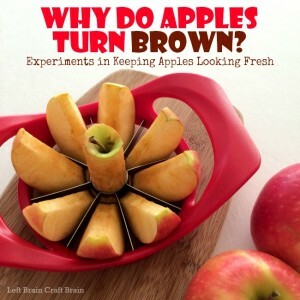 I thought it would help the process to first learn what makes apples turn brown in the first place. Essentially your apple is rusting in a process called oxidation. Once the apple is cut or bruised, oxygen in the air combines with iron in the apple to form iron oxides. Enzymes in the fruit (like polyphenol oxidase) make this process go faster. The oxidation process is also what causes metals to rust. You can reduce browning by slowing oxidation in three different ways. 1) Cook the apples 2) reduce the exposure to oxygen or 3) reduce the pH of the fruit. Doing both by covering in an acidic liquid is the best way to keep apples from turning brown without cooking. It’s time to formulate a hypothesis… Before the experiment, ask the kids a couple of questions. Their opinions will be their hypothesis. Which method do you think will work the best? Which one do you think will taste the best? It seems like everyone has an idea on the best way to keep apples looking fresh! We asked our friends for ideas (ummm, I mean I looked on Pinterest.) 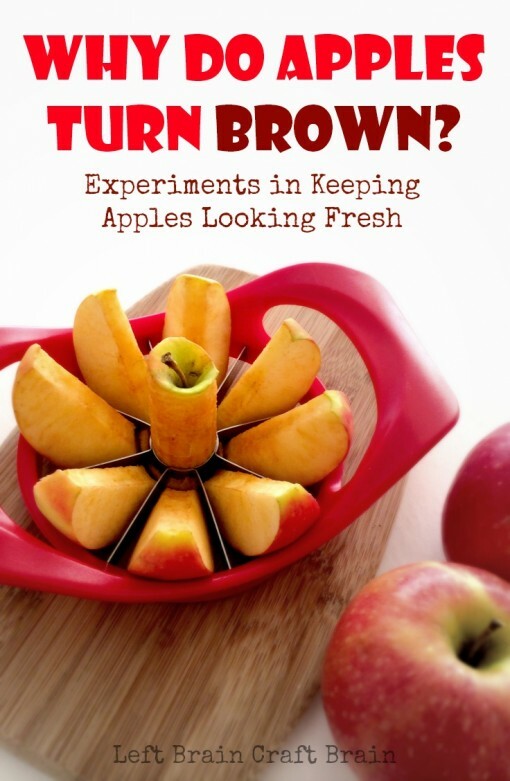 Here’s what we tried… Be sure to add a control which will show you how the apple turns brown with no treatment. First set out 8 bowls big enough to cover the slice completely with the solution. Label each bowl so you don’t mix up the solutions. Make each of the solutions in a separate cup. Cut one apple into 8 slices of approximately the same size. If you use more than one apple, you’re adding variables to the experiment as some apples may brown at different rates than the others. Place an apple slice into each bowl. You can use the core as the control. Immediately cover with each solution, one per bowl. Pour off solution and inspect each apple for brown color. Record levels. Taste apples and record impressions. Which ones kept the apples the whitest? Plain water doesn’t work. Carbonated water is a touch better, but not that much. Plus it gives a slightly bitter taste to the apples. Salt keeps the apples really white, but yuck! did not taste good. Probably need to try this with less salt. Lemon juice works well too, but also changes the flavor of the apples. Good for fruit salad, maybe not for plain apple slices. Vitamin C works just ok, but definitely not well enough to be worth the hassle of crushing tablets. The lemon lime soda worked too, but they tasted like apples soaked in soda. Duh, right? Too candy like and not really that healthy, so out. So the winner is…. HONEY! The apples weren’t quite as white as with salt and lemon, but the taste was sooo yummy. Like unadulterated apples, just deliciously sweet ones. 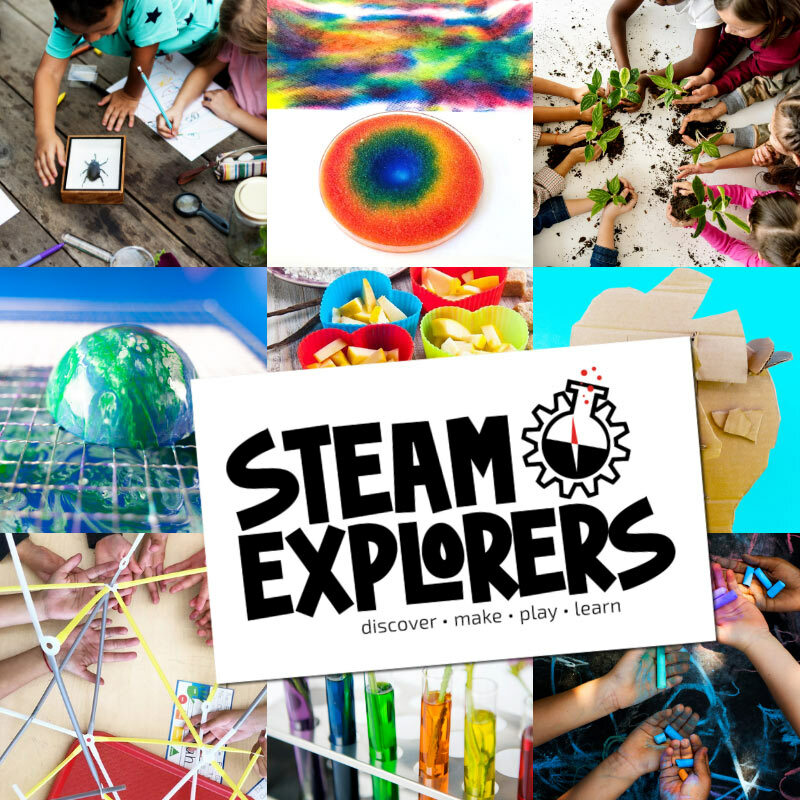 For a few more apple themed activities, check out some shared by my blogger friends during the Love to Learn Linky last week. Great experiment idea! It’s simple enough for little ones, and tasty too! Thank you for featuring me this week!! This is a great experiment. I know that apples turn brown based on oxidization. 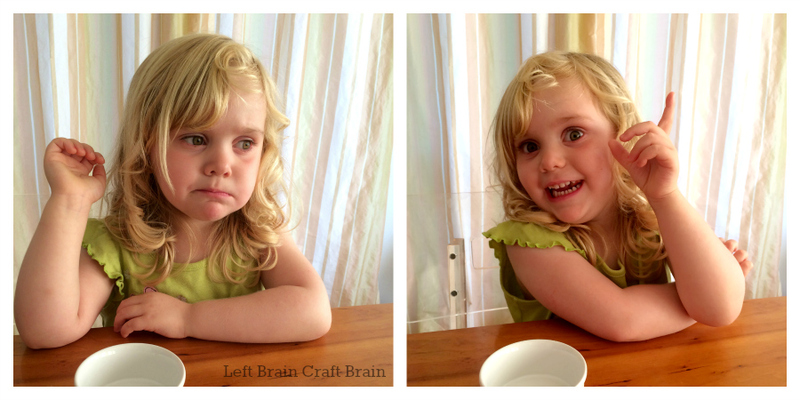 I love your experiment and the look on your sweet girl’s face with the “HMMM.” And good to know – honey!!! 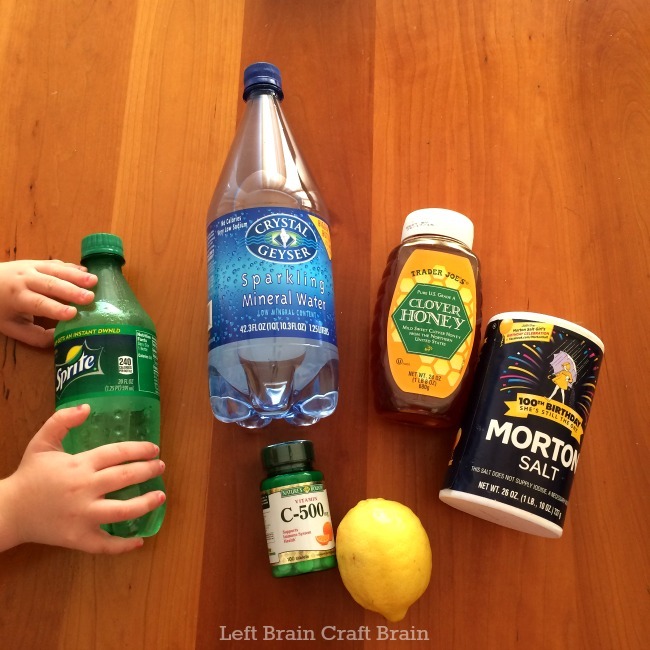 We also tried lemon juice in the past but then my son wouldn’t eat them because like you said – flavor!! Great experiment!! I did this with my 4 year old. We though honey tasted amazing to the rest!!! Salt was our whitest…..but our tap water was actually whiter in comparison to most..makes me wonder what is in our tap water….hmmmm…another project on the horizon. :) Thanks again!